A full-length uncensored hoot of a backwoods caper. Gertie Johnson is on cloud nine when Grandma Johnson goes away on a week-long outing. But after cohorts Cora Mae and Kitty fail their concealed carry class, they soon realize that someone is aiming to kill. I love Gertie and her bff's. They keep me laughing, and never disappoint. The characters are well written and sometimes remind me of my real life friends! Thank you for the series, and please keep them coming in the future! Gertie is so much fun to write! Yes, please keep the Gertie Johnson mysteries coming. My daughter and I absolutely love Gertie, Kitty, and Cora Mae and the precarious situations they get themselves into. These characters are down-to-earth and extremely likable. Also love the setting in the U.P. with its' outdoor loving residents who freely exercise their Second amendment rights. 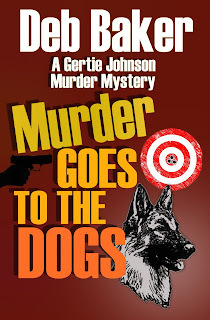 Would like to see your newest Gertie release, Murder Goes to the Dogs, in paperback form. I see that it is currently only available in Kindle edition. However, I truly prefer reading in traditional paper and ink. Guess I am just old fashioned that way. I own all of your previous Gertie Johnson books and would love to add the newest to my collection. Hope that this is a very real possibility. Hi Bea, thank you so much for reading Gertie's stories! I lost my cover designer before the print edition was created (a much more intricate project than an ebook) and will need to find someone else to finish it. I will let you know. and friends are like my favorite neighbors. You sure know the UP and the grit we all have. The Trouble Busters are a hoot and a half. My only complaint is that I get through the books too fast and I wish there we even more of them. Haha, you made my day! I remember when I was told to 'write what you know' and I had a devil of a time coming up with ANYTHING that I knew - until it dawned on me - the Michigan Upper Peninsula is my homeland and it is so different than anyplace else.